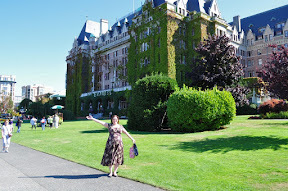 At the Empress Hotel in Victoria, B.C. Cruising, for most people, invokes images of passengers in deck chairs with umbrellas drinks in hand. That’s not the case with me. At least not yet. For me, when in port there’s sightseeing to be done and the bustle that arises from acting every bit the busy tourist. But one unique aspect about a cruise vacation is that — though already having “wound down” away from everyday life — one can take time to wind down between ports. That’s what we did the day after leaving Skagway. 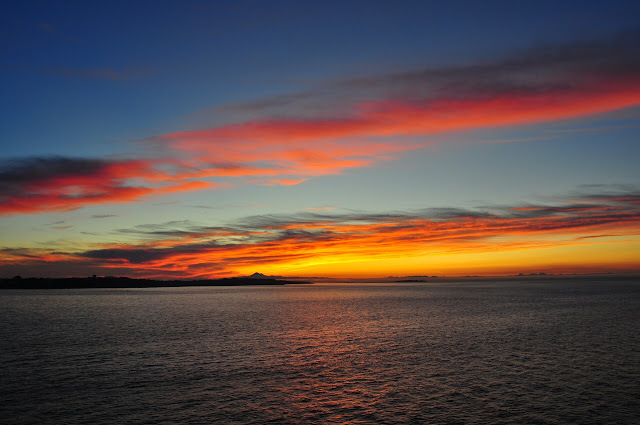 We were at sea, steaming toward Victoria, B.C. Without conscious thought, we made it somewhat of a quiet day. Almost winning a passenger trivia game in the morning, a leisurely lunch, and time spent in a hot tub with a view astern to the ocean; a quiet pause in the closing days of a superb vacation. Sunshine greeted us the next morning in Victoria, where what is regularly referred to as “High Tea”* awaited at The Empress Hotel. More accurately, The Empress refers to it as “Afternoon Tea.” To be polite, I’d practiced the proper pinkie curl. Gwendolyn’s little finger would be curled under and away from the heat of the cup which might otherwise inflict a burn on her delicate skin. The little finger would never be arched upward. Arching would be deemed a sign of extreme arrogance. Should you know of moments extreme enough to demand an arched pinkie, contact us immediately. There was a remarkable consistency to the extraordinary knowledge imparted by tour guides and bus drivers we met during this trip, and our driver in Victoria was no exception. He filled our nearly hour-long drive to, in and around the city with history, trivia and pop culture references. Soon enough we disembarked in front of the impressive Empress Hotel. Above the commoners' side entrance to the Empress Hotel. 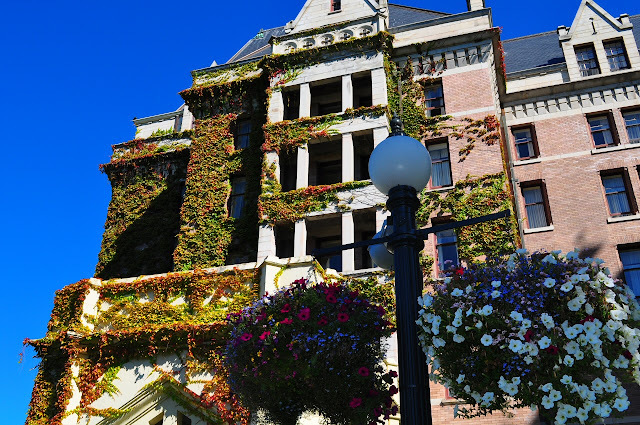 The 103-year-old hotel near Victoria’s waterfront can’t be missed, and there’s a story that for many years it did not have sign out front because of local sentiment that anyone who didn’t know it was The Empress shouldn’t be staying there. It is an imposing structure that’s hosted kings and queens and a fair share of celebrities. Wondering if we weren’t worthy of a public arrival, we entered through a side door to find the Tea Lobby. With everyone seated on sofas upholstered with richly patterned chintz or in wing back chairs, our hostess set about placing tiered stands stacked with traditional tea sandwiches, pastries and cakes. Our starter was a bowl of big, tasty blueberries, certainly not an everyday occurrence for me, but something I could get accustomed to. Our cups were filled with The Empress’ tea (a blend of teas from Kenya, Tanzania, South India, Assam, Sri Lanka and China), and though I’m not a big tea drinker, it was tasty (and fun—how often does one get to say “I’ll take two lumps” without ending up with a headache?). I don’t pretend to be a gourmand but found great pleasure in the tea sandwiches and cakes served at The Empress. Even the cucumber and watercress sandwiches were good. My personal favorite was the smoked salmon and cream cheese sandwich. Our gastronomic climb up the stand found a second tier filled with some of the best-ever fresh scones and preserves, and ended with the top tier’s assortment of light pastries. It was all good, but I was left wondering how such dainty sandwiches and pastries could be so filling. We’d have another day at sea before arriving home, and there’d be whales, porpoises, and a special dessert courtesy our maître’d. But Victoria was the last big “hurrah” for me on this fantastic trip. Categories: Alaska, British Columbia, Family, San Francisco Bay Area, The Wife, Vacation & Travel | Tags: Alaska, British Columbia, California, Canada, vacation | Permalink. 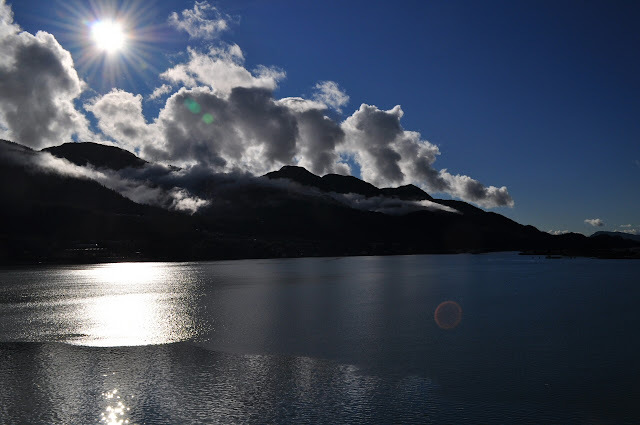 Promise in the early morning over Ketchikan, Alaska. 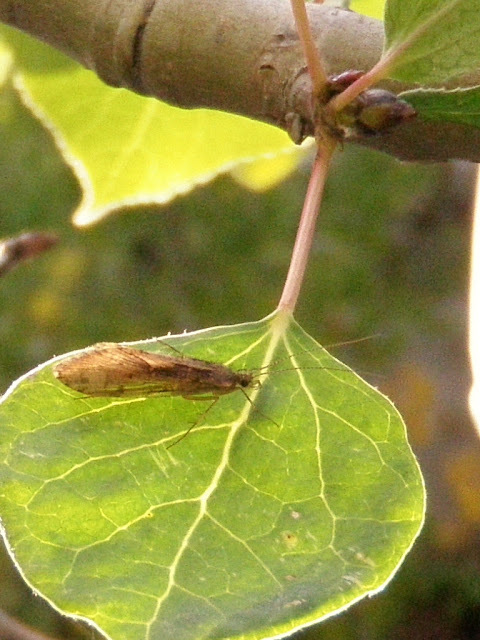 Caddis on leaf over Rock Creek, Calif.
Sun Setting west of Juneau, Alaska, above Douglas Island. Sunset somewhere off the coast of Canada. Categories: Alaska, Canada, Mark, Sierra Nevada, Writing Prompt | Tags: Alaska, British Columbia, flies, Sierra Nevada | Permalink. 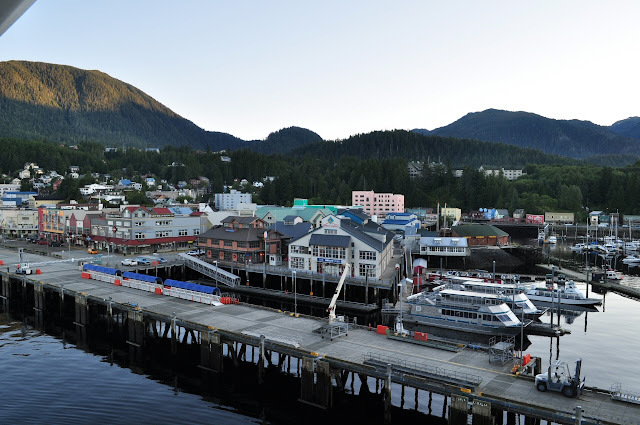 We’re back after travelling from San Francisco to Ketchikan, Juneau and Skagway, Alaska, and back again in 10 days…leaving at the end of August and returning to the start of September. I’d say our trip when by fast, but the ship rarely exceeded 21 knots and the days were packed with the history, wilderness and the people of Southeast Alaska. There was amazement that two of our ports o’ call can only be accessed via plane or boat. Pink salmon crowded the rivers and brought out the bears. We tasted beer that can’t be found anywhere else. Pictures for now; words later. Categories: Alaska, Beer, British Columbia, Canada, Family, Salmon, San Francisco Bay Area, The Wife, Vacation & Travel | Tags: Alaska, Alaskan Brewing Co., beer, British Columbia, Canada, cruise ship, Juneau, Ketchikan, photography, salmon, Skagway, Skagway Brewing Co. | Permalink. It’s not that we’re abandoning the six regular readers out there, but three-hundred and fifty-nine days have passed since plans were laid and, finally, we’ll be cruising to Alaska just about 14 hours from now. There’s no fishing in the plans, but that’s not to say it won’t come to pass. (The Wife’s never put the kibosh on fishing and is even encouraging I do so this trip.) Regardless, there will be thoughts of fishing…in the suitcase is what’s needed to tie the flies I lose in trees use most. It’s been a crushing week lining up the ducks. Everything’s been done that could be done at work, and whatever’s undone at home will be left that way. It’s not that I’m truly selfish and don’t appreciate those who spend a few seconds minutes stopping by, but don’t expect much in the coming week and a half. It’s just that there’s no guarantee that there’ll be a connection to the Interwebs or willingness to step away from the buffet or bar long enough to write. I do promise to wave from under the Golden Gate. Categories: Alaska, British Columbia, California, Oregon, The Wife, Washington | Tags: Alaska, British Columbia, California, Cruise, Oregon, Washington | Permalink. Categories: Fly Fishing, Weather, What We See | Tags: April Vokey, British Columbia, California, catch and release, fashion, fly fishing, fly fishing apparel, trout, waders | Permalink.